The signature facility of our Bike Club and the wider Meraloma Athletic Club in general is our vintage clubhouse which dates back to the 1930's. 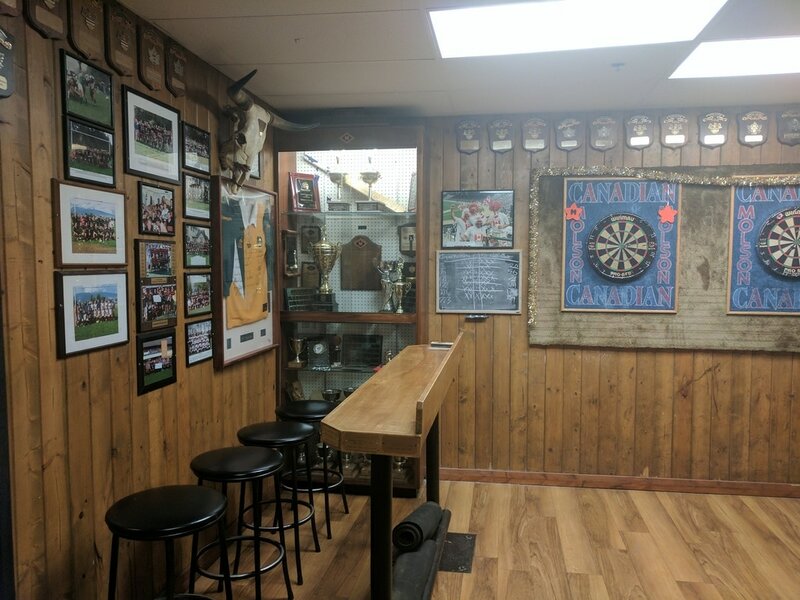 The picture on the left shows the trophy room and along the wall hundreds of team pictures for Rugby, Softball, Soccer, Cricket and other sports enjoyed by fellow Meralomas. It's rife with local athletic achievement (some of it on the world stage) and represents a proud tradition as well as an inspiring vision for the future. The Club House is well situated at the top of Connaught Park athletic fields in the heart of Kitsilano, BC and when you enter, you not only step back in time but you experience the charm and tone of a British Pub somewhere in the Midlands. There is a fireplace, dart board and baby-foot table. There are also showers, dining facilities and a bar. It's absolutely wonderful for get togethers and entertainment.